Mary Henley Rubio has spent over two decades researching Montgomery's life, and has put together a comprehensive and penetrating picture of this Canadian literary icon, all set in rich social context. Extensive interviews with people who knew Montgomery - her sons, maids, friends, relatives, all now deceased - are only part of the material gathered in a journey to understand Montgomery that took Rubio to Poland and the highlands of Scotland. From Montgomery's apparently idyllic childhood in Prince Edward Island to her passion-filled adolescence and young adulthood, to her legal fights as a world-famous author, to her shattering experiences with motherhood and as the wife to a deeply troubled man, this fascinating, intimate narrative of her life will engage and delight. It feels like I've always adored L.M. Montgomery because her books are so intertwined with my childhood. I first fell in love with Anne Shirley, but I quickly grew to love her other heroines and quirky secondary characters. I'd originally planned to re-read a number of her books last summer, but I ended up just spending time with the first three Anne books. Well, I got the L.M. Montgomery itch again this year and picked up on the Anne series where I'd last left off. Revisiting a series that meant so much to me was a delight, but I also saw some aspects of it in a whole new light as my age and experiences brought new parts of the books to life. That's something I love about re-reading - a book is never quite the same each time you read it. The words may not have changed, but your interaction with it does. So, my Anne re-read made me curious about the woman behind the books. What was she like? How did her life impact or inspire her writing? And what was her story? While I knew a little about her life (from previous reading), I didn't know her full history. This book is considered the definitive Montgomery biography at almost 700 pages, and I was excited (but a little intimidated) to dive in. As with many biographies, this book will likely be most interesting to Montgomery fans. While it's a well-written and engaging book in its own right, I do think that you'd want to have read and enjoyed some of her books to fully appreciate this biography. For the most part, I found the book to be incredibly interesting. It never felt boring or pedantic (although I did enjoy some sections more than others). Since Montgomery lived various places during the different stages of her life, Rubio has divided the book into sections that correspond to those places and time periods. Montgomery was a prolific journaler throughout her life, and I believe the book sections also correspond to the five volumes of her journals that have been published. I did wish for a little more information about the Prince Edward Island period of her life since it covers the largest span of time (36 years) but only represents about a fourth of the book. I do have theories about why this is the least represented time of her life (such as the fact that she appeared to journal more heavily in her later years), but it did leave me wanting more in the very beginning of the book. I have not read Montgomery's journals, but Rubio does reference them often in the book. I didn't feel as though I needed to have read them to understand the events taking place, but there were a few times that I wished Rubio had perhaps elaborated a little more on certain events. However, in other cases, there were a few details that were repeated a number of times (within a few pages of each other and almost word-for-word) to the point that the repetition was a little annoying. Either way, the research that Rubio put into this book is clearly evident. What's interesting about Montgomery's life is that there is a central conflict between, as she describes it, her "passionate Montgomery blood and the Puritan Macneill conscience." This battleground - the tension between passion and conscience - is highlighted throughout her life. Another key discussion point in her life is depression and mental illness. Montgomery and her husband both suffered in ways that made their lives so tragic. These overarching themes make for a fascinating character study, particularly in light of how "happy" most of her novels are. There is also interesting information about her sons, one of whom broke her heart and embarrassed the family with his behavior, and the way her relationship with them impacted her mental state. I was also intrigued by the information about the lawsuits with her American publisher and getting a peek at her writing process. She was continually producing more work - from full-lenth novels to short stories - and I loved getting to see how her books and life both overlapped and diverged. Montgomery's work was highly praised when her debut novel, Anne of Green Gables, was published but she had fallen out of favor with the literary world by the end of her life. It was heartbreaking to read about how a beloved author was ultimately shunned and shut out from the world she loved so much. This was an aspect that made me want to do further research on her place in Canadian literature. There's so much I could say about this book - from the research that went into it to the revelations about her life - but I think it's enough to say that this has been one of my favorite reads of 2013 so far. 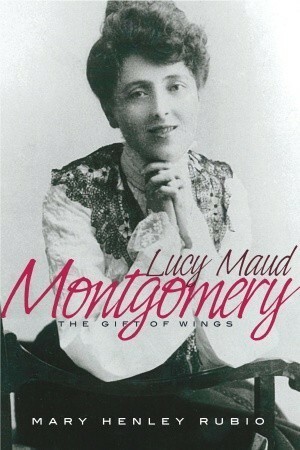 If you love Montgomery's books, I'd highly recommend this biography for a look at the woman behind the pages. I think Montgomery's struggles make me appreciate her books all the more because it's even clearer to me now how much writing meant to her. "One cannot have imagination and the gift of wings, along with the placidity and contentment of those who creep on the earth's solid surface and never open their eyes on aught but material things. But the gift of wings is better than placidity and contentment..."
Yes, this is definitely a chunkster! It was heartbreaking to read about her life. She accomplished so much, but she was also plagued by so much sorrow and pain. And it was sad that she never knew how loved her books would end up being! While they were loved when she first published them, she definitely died at a time when her popularity had gone down significantly because of the literary community. I definitely think that reading biographies/memoirs can be tricky - it's like there's always a certain time period or section where you want to linger and have more information.